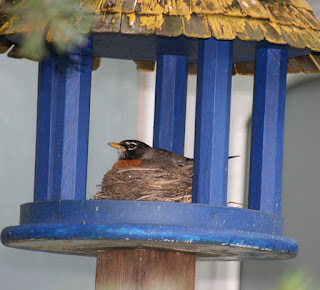 Caught sight of this robin mom at a local conservatory while some friends and I were taking in the beauty of the summer flower show. This lovely lady was non-plussed to have her picture taken, and basically refused to even acknowledge the visitors who one-by-one spotted her sitting in a bird feeder off the path. The robin was so still that we had to ask ourselves if she was real, but realized pretty quickly that she was. Just sitting around, taking care of her eggs, resting a little before the chaos begins when her baby birds break through their eggs and demand to be fed.